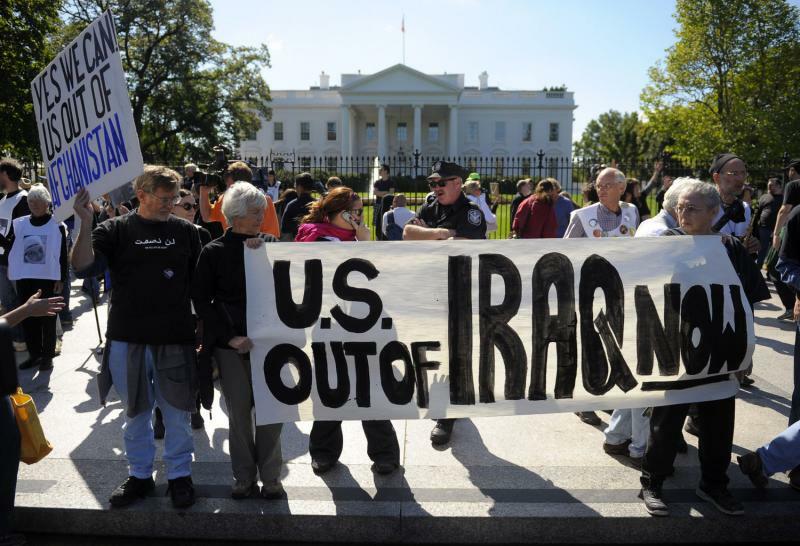 An estimated 500 people gathered at the White House yesterday to protest the wars in Iraq and Afghanistan and to request a meeting with President Barack Obama. Some of the demonstrators chained themselves to the White House fence and some lay prone on the sidewalk as if they were dead, while others chanted "mourn the dead, heal the wounded, end the war". Sixty-one were arrested. Some 800,000 teachers, medical workers and other public-sector staff went on strike in Romania yesterday to protest pay cuts imposed by the government under pressure from the International Monetary Fund. Hospitals only dealt with emergencies and teachers supervised children without conducting lessons. About 10 people were involved in the blockade of a coal loading depot in South Lanarkshire as part of a protest against open cast coal mines in the area and 13 new mines due to open in Scotland. Five were arrested. About 110 protesters sang and spoke about the need for health care reform in front of UnitedHealth Group’s corporate headquarters in Minnetonka, Minnesota yesterday. Six were arrested for blocking the entrance. About 200 D.C. high school students skipped classes yesterday morning to march on the offices of Chancellor Michelle A. Rhee and protest the layoff of 229 teachers last week. Hundreds of Palestinians gathered in the West Bank capital of Ramallah yesterday to protest the Palestinian Authority’s support for delaying the endorsement of a UN report on possible war crimes committed during Israel’s Gaza offensive. Around 700 expatriate labourers held a protest in downtown Kuwait on Sunday to demand payment of their salaries they say are three months overdue.